If you’re like me, then you tend to find yourself wanting to automate as much as possible, or at least be able to work with sets of data in a way that quickly allows you to get to the root of an issue rather than clicking through endless screens of information. In case you were curious, Office 365 makes use of Azure Active Directory behind the scenes for user managment. As Azure Active Directory is an enterprise resource for identity management for cloud hosted applications, Microsoft has gone to great length to create several interfaces to it. Granted, I could just use a REST call through the Microsoft Graph API to create or delete a user through a POST command, but I can also use PowerShell from a Windows based device. From there you can parse your users and make modifications to your hearts desire. Running “Get-AzureADUser” enumerates all user objects. Load it into an array and work with the users as you wish. – Support for creating, deleting, listing, and submitting jobs to HDInsight clusters with Linux Operating System. If you haven’t clicked on the link at the top yet, head on over to the Web Platform Installer or the Windows Standalone installer to get moving forward with the 0.8.16 build of the Azure PowerShell commandlets. Also, if you’re using Visual Studio, there was a point release update to version 2.5.1 that might be of interest to you – .NET SDK for Visual Studio. Recently I came across a thread on SPYAM regarding whether it’s possible to block SharePoint 2013 installations using group policy or through the registry. 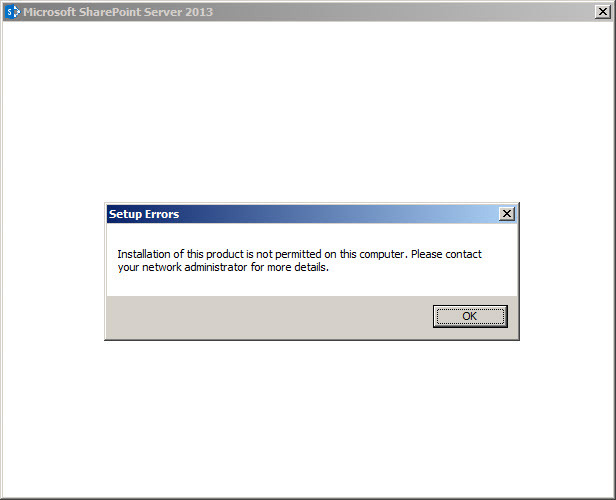 Sure enough it’s possible to use the SharePoint 2010 installation blocking technique for SharePoint 2013 with a minor modification. Rather than having the Registry Key be for 14.0, just modify it to be 15.0. With a DWORD Value of ‘DisableInstall’ with a property value of 1. Recently I stumbled upon a SharePoint 2010 environment setup a long time ago where the managed accounts and accounts in general were setup a little funny… in particular the issue was that the profile service stopped syncing. I asked the administrator what the issue was and they stated that they’d setup the system to use a managed account for the farm service account and other service application service accounts to automatically change the password in the background. That’s all fine and dandy for the most part, ‘cept that there are caveats with the Farm Account. And low and behold, I checked and sure enough the system’s Farm account was setup now as a Managed Account in our trusty, friendly SharePoint 2010 instance. Issue – the profile synchronization service runs as this service account. Caveat, profile sync requires that you enter the account information and credentials since you may not necessarily be sync’ing with the Active Directory resource forest that your SharePoint system leverages as its Windows Networking Infrastructure platform. So how did we attempt to remedy this… not knowing the Farm password, it was updated in Active Directory and then using Set-SPManagedAccount with the -UseExistingPassword argument, the password was properly updated. It was then synchronized across the farm with Repair-SPManagedAccountDeployment. So SharePoint should now be up and operational with the managed account password updated, but we also have to go and update the synchronization connection with the new password. All should be working and fine, crisis averted, just have to go in Central Admin and make the update there… But, what I thought would be a five minute fix… well, yeah, not so much. Oddly, after all of the troubleshooting it ended up being the bitness setting for the Application Pool that operates SharePoint was modified to operate in x86 emulation mode. This comes in handy when you need to run two different compilations of a DLL through IIS, but with our native 64 bit SharePoint application, this doesn’t work so well. Why does this happen though? Not certain but it would seem that several folks seem to have this problem when they’ve been running their SharePoint system with managed accounts automatically updating and then reverting back to an “unmanaged mode” so to speak where the metabase becomes corrupt and suddenly the fitness for x86 emulation is set to true. Please only modify this if you’re running into this problem – definitely make a backup copy before making any changes!!! Note you’ll have to do this for each of the Web Applications that are registered – if you choose to make this modification. And just like that… I start the application pool and all is well. Went and updated the synchronization connection and our UPS started syncing again. Qed.